Energy recovery at a wastewater treatment plant could lead not only to a sustainable system based on energy requirements but also to production of a net excess of energy. An MFC would be used in a treatment system as a replacement for the existing energy-demanding bioreactor (such as an activated sludge system), resulting in a net energy-producing system. However, we do not yet know how to economically scale up an MFC or what the costs would be to replace a conventional system with an MFC-based design. Scale-up and materials issues are the greatest challenges in the application of MFCs for wastewater treatment. Data on the natural environment can be helpful in understanding and modeling ecosystem responses, but sensors distributed in the natural environment require power for operation. MFCs can possibly be used to power such devices, particularly in river and deep-water environments where it is difficult to routinely access the system to replace batteries. Sediment fuel cells are being developed to monitor environmental systems such as creeks, rivers, and the ocean. Power for these devices can be provided by organic matter in the sediments. Power densities are low in sediment fuel cells because of both the low organic matter concentrations and their high intrinsic internal resistance. Systems developed to date are limited to producing <30 mW/m2. However, the low power density can be offset by energy storage systems that release data in bursts to central sensors. An MFC can be modified in interesting and useful ways, and this can lead to new types of fuel-cell-based technologies. With such modifications, however, these systems may no longer be true fuel cells because they do not produce electricity. One such application is the modification of the basic two-electrode system for bioremediation. The MFC is not used to produce electricity; instead, power can be put into the system to drive desired reactions to remove or degrade chemicals, such as converting soluble U(VI) to insoluble U(IV). Bacteria are not only able to donate electrons to an electrode but can also accept electrons from the cathode. 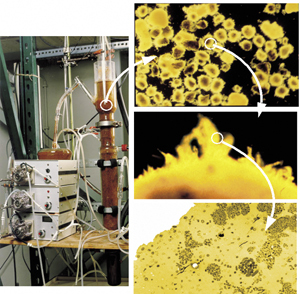 By poising the electrodes at –500 mV, Gregory et al were able to precipitate uranium directly onto a cathode because of bacterial reduction. Nitrate can also be converted to nitrite when electrodes are used as electron donors. Electrolytic cultivation has been used to extend the growth rates of suspensions of iron-oxidizing bacteria in the laboratory. MFCs can also be modified to produce hydrogen gas (H2) by removing oxygen at the cathode and adding in a small voltage via the bioelectrochemically assisted microbial reactor (BEAMR) process or the biocatalyzed electrolysis process . Bacteria produce an anode working potential of ~–0.3 V. The protons and electrons that are produced at the anode can combine at the cathode to produce H2 with only an additional total cell potential of 0.11 V. In practice, however, 0.25 V or more must be put into the circuit to make H2, because of overpotential at the cathode. As much as 8–9 mol-H2 could be produced in a process that uses glucose, in which a first-stage fermentation system achieves 2–3 mol-acetate/mol-glucose and a second-stage BEAMR process recovers 2.9 mol-H2/mol-acetate produced. The power needed for the second stage is estimated to be equivalent to 0.5 mol-H2/mol-acetate. This may be an economically viable process for producing H2, because a recent U.S. Department of Energy report estimates that 10–12 mol-H2 would need to be made per mole of glucose to make this route of H2 production viable. Biohydrogen production via the BEAMR process is not limited to glucose. Any biodegradable substrate that produces electricity in an MFC should work in a BEAMR system. Recent research has shown that the process works with domestic wastewater, but H2 recoveries in current reactor designs are still too low to make H2 production with BEAMR likely to be as viable as electricity production with MFCs. For the BEAMR process, high-strength wastewaters appear to have the most immediate promise for H2 recovery. and microbial fuel cells. In enzymatic fuel cells, the potential difference is created by the use of two electrodes with different enzymatic reactions, creating a potential difference based on the reaction redox potential (Pizzariello et al. 2002). Also micro-organisms can be used, such as Saccharomyces cerevisiae (Chiao et al. 2003). Micro-organisms have the advantage of providing a more long term stability than enzymes immobilized onto a surface.